The Westminster Dog Show is old reliable, a calming nigh-whisper of a brook among the murky and turbulent sea that is everything else on the 1153 cable channels you currently employ. But this year, the proper showcase of best in breeds is adding something new: CATS, MY DUDES! Well, one cat, anyway. 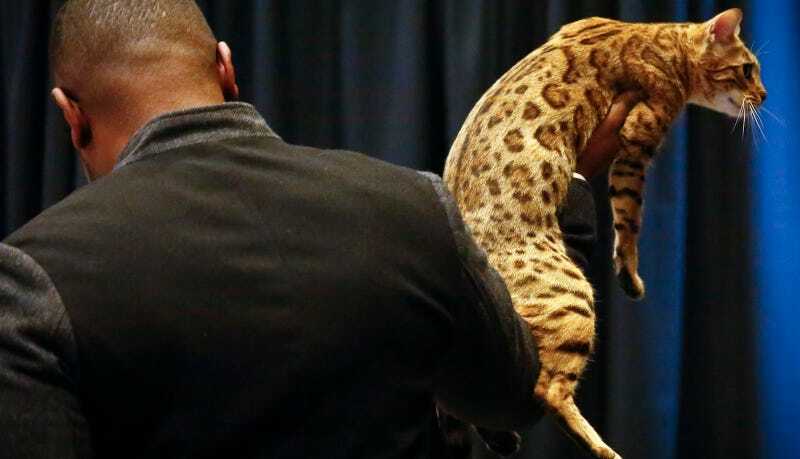 At a press conference today for this year’s Westminster, held February 14 and 15 at Madison Square Garden in New York City, some of the competing animals were introduced, including the above beautiful cat, whose name is Jungletrax Abiding Ovation, which also sounds like an extremely sick record label that releases underground Detroit house exclusively. Rather, Jungletrax is a Bengal from Maryland whose owner, Anthony Hutcherson, calls her “the love of my life.” I know we just met, Jungletrax, but same! Oh, right—dogs. These little babies are Sloghis from Illinois via the Czech Republic, and they’re one of three breeds that have never been seen at Westminster before. This is Zsa Zsa from Connecticut. She’s a Pumi, which the AP calls an “ancient Hungarian herding breed.” The other dog breed new to Westminster is the American hairless terrier, which is about what it sounds like, a walking talking hot dog. This dog’s name is BOBBY and he’s an All-American breed. Can BOBBY beat Jungletrax? Place your bets now, surely by February bookies will be legal.